A whirlwind weekend visit from Glamorous Sister No. 2. Anyway, enough excuses – let’s just say I have lots of food stories to catch up on. Glamorous Sister No. 2 brought her boyfriend, Strong Silent Type, along for the trip and since he had never been to Melbourne before, The Brooding Architect and I were keen to share some of our favourite Melbourne experiences. We ate breakfast at La Paloma, we had fancy cocktails at New Gold Mountain, we soaked in the hot springs down the Peninsula and we had dinner at our local, Tom Phat. Tom Phat is a modern Pan Asian restaurant located on Sydney Road, Brunswick. The half-Singaporean part of me tends to avoid any restaurant which describes its food as ‘Pan Asian’ – but the food at Tom Phat genuinely works. The flavours are predominately Thai and Vietnamese with lots of coconut-y curries, tangy tamarind and fresh chilli and lime. These flavours are all rolled together in the signature dish of crunchy pork belly and seared scallops served with a sweet caramalised sauce. I have eaten this (too) many times before and vouch for how good it is. 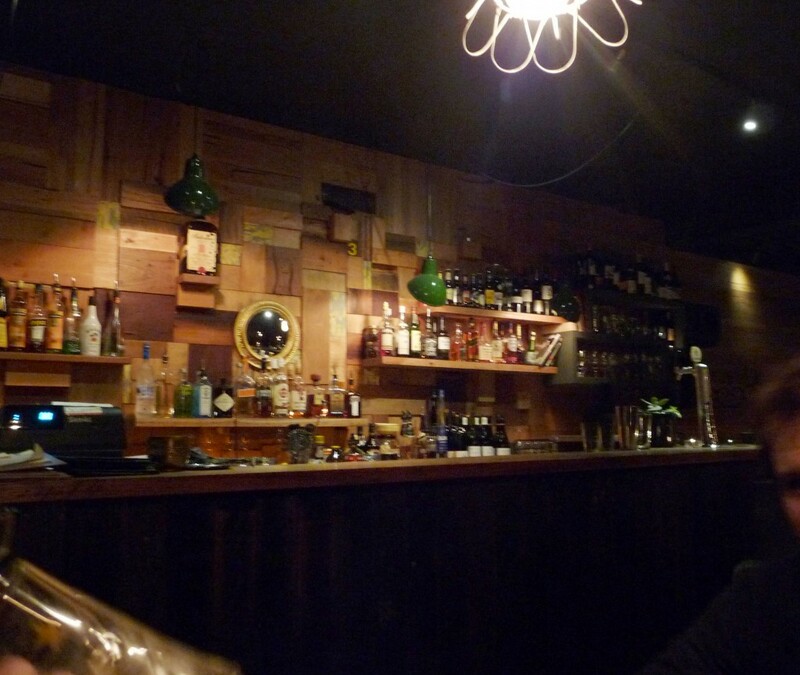 Tom Phat has has recently been expanded to include a trendy bar section with cozy booths, Sapporo beer on tap and a great record selection. Most importantly though, you can sit in the bar section and still order from the full restaurant menu. The bar area is dark, brooding and a little rough around the edges (or as I like to say, the bar equivalent of The Brooding Architect). 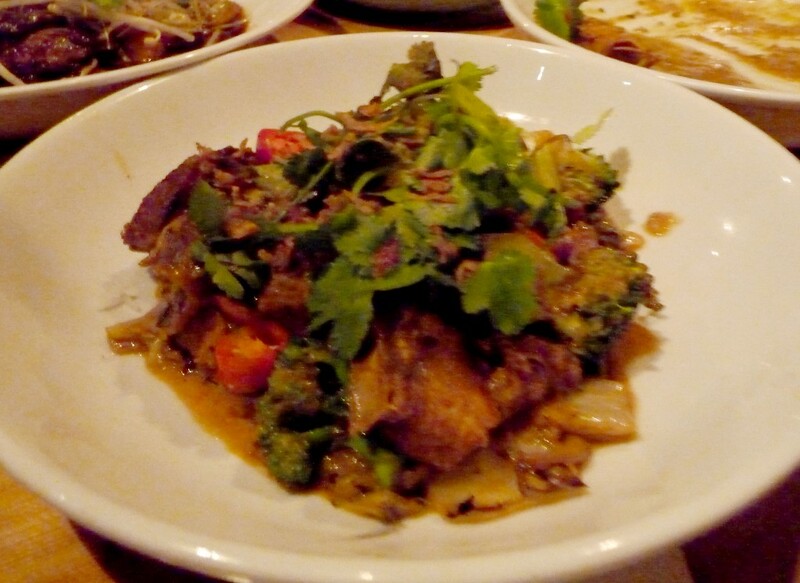 The main meals at Tom Phat are very generous, so you can easily skip an entree (to save room for dessert of course). Between our group of four we shared two entrees and four mains and still had to be rolled out the door. 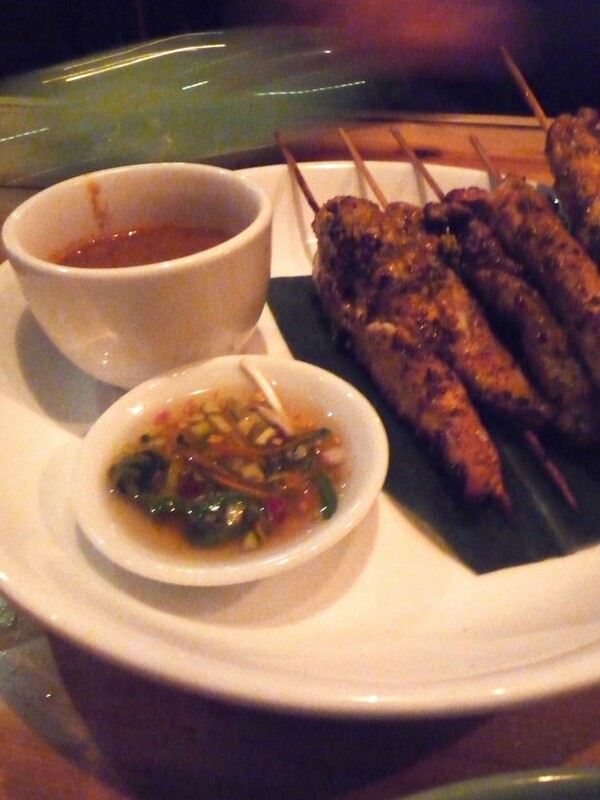 We started with some smoky chicken satay sticks ($9.50), served with a crunchy peanut sauce and some spicy Thai fish cakes ($8.50), served with a traditional Thai sweet chilli / lime / cucumber dipping sauce. Again, let me stress that portion sizes are extremely generous – there were 5 chicken satay sticks and 6 fishcakes in each serve. 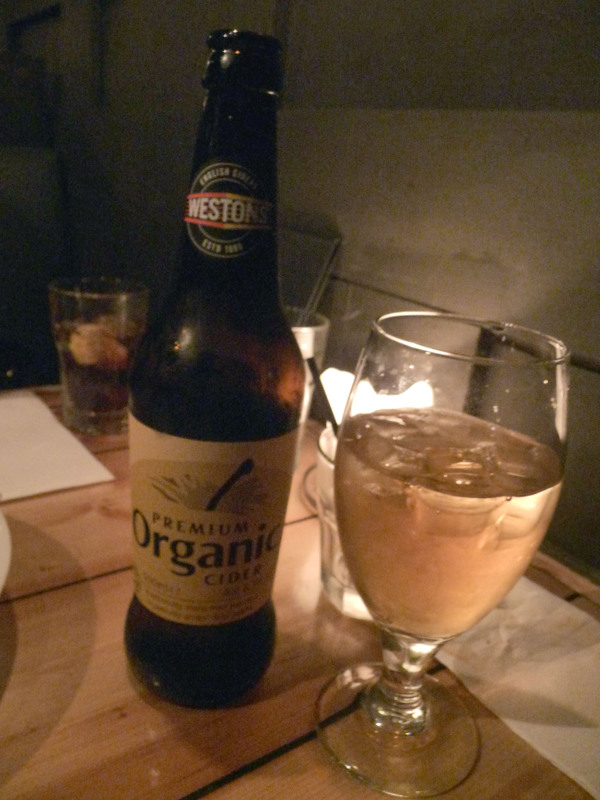 The entrees are not 100% authentic, but they were fresh and packed with plenty of the right – and when washed down with a round of Sapporo beer ($6 per pint) and some Westons Organic Cider ($12 for a 750mL bottle) authenticity does not seem to matter that much. The prawns were so delicious that the whole plate had been eaten up before I even remembered to take any photos. The prawns had been cooked in the shell, which although makes the dish a bit more tricky to eat, but results in a juicy, succulent end product. The prawns were slathered with a rich coconut sauce and served with lots of fresh chilli, coriander and lime. In true (half) Singaporean style, Glamorous Sister No. 2 and I sucked the juicy goodness out of the prawn heads, while The Brooding Architect and Strong Silent Type looked on with disgust. I am one of those people that likes to order duck when I go out for dinner, for the simple reason that it is not something that I cook at home (if I did, I would probably end up with a common aliment amongst lawyers – gout). The duck was beautifully cooked. The meat melted in your mouth, allowing you to savour the infused flavours of star anise, Chinese five spice, ginger and soy sauce. 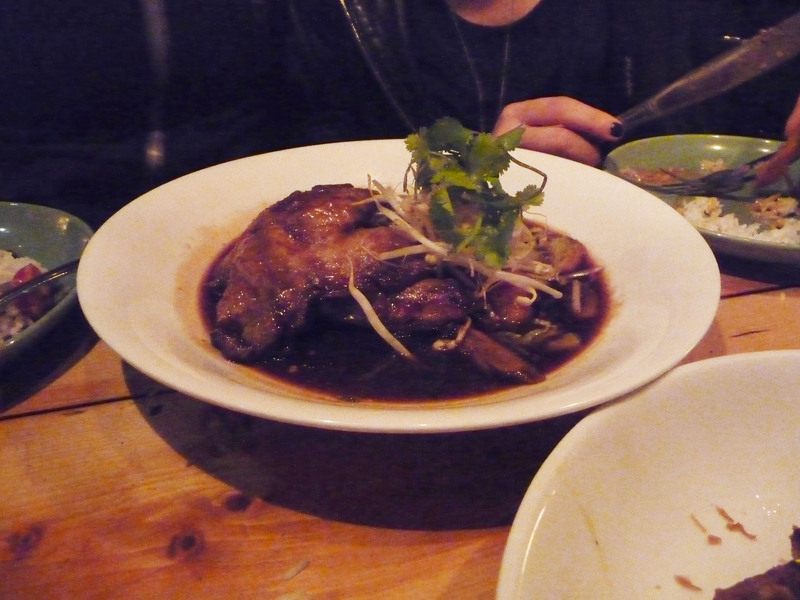 The dish was very rich though – certainly recommended for sharing, unless you are a true duck aficionado. Next out was the Thai Red Curry. Using pork belly in place of the standard chicken or beef, transformed a simple Red Curry into something unique. The curry had all of the usual suspects you would find in a Thai-style red curry – coconut cream, dried red chillies, galangal and fish sauce. The dish was lightened up through the addition of fresh red chillies, coriander, lime and cherry tomatoes. This really assisted in balancing the richness of the pork belly. Despite a not so promising start, the Barramundi was my dish of the night. The first time the Barramundi came out it looked fantastically impressive, but unfortunately was not cooked all the way through. 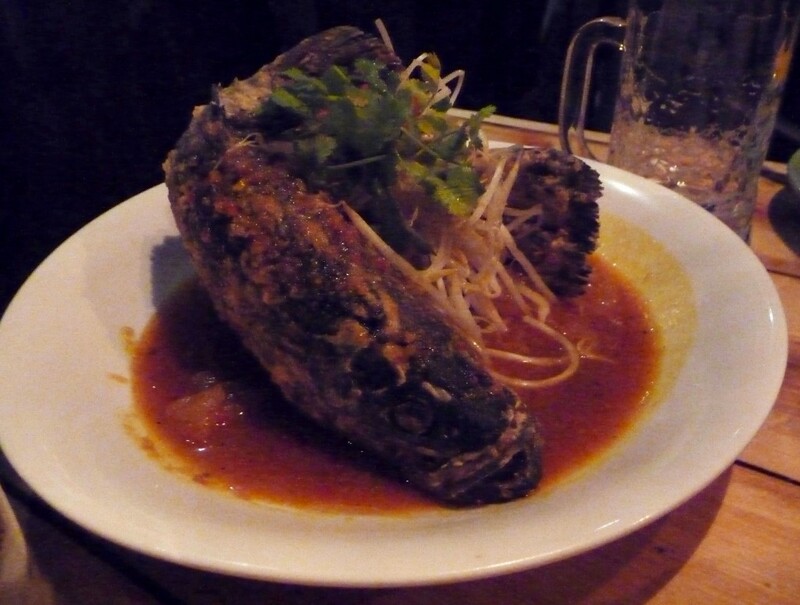 When we brought this to our waiter/barman’s attention he quickly organised a replacement Barramundi for us. No questions, no attitude and no snarkiness whatsoever. It was even generously and unexpectedly taken off the bill at the end of the night. Refreshingly good service. Fortunately, Barramundi No. 2 came it out cooked to perfection. 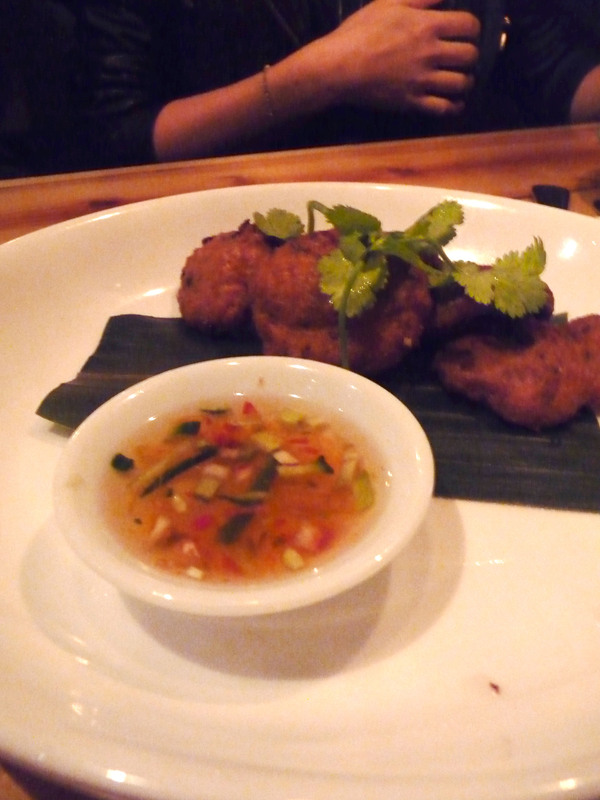 The skin was crispy and crunchy, a wonderful contrast to the sweet fish flesh and tangy tamarind and chilli sauce. Sadly, given that we had been eating and drinking for two days straight, there was no room for dessert. If I had any room at all I would have ordered the delicious sounding Five-Spice Banana Spring Rolls with coconut icecream. I’ll save that for next time. And we hope to see you guys soon! The French Connection: You know The Brooding Architect and I too well. Potatoes and cheese combined – life does not get much better! Plans are on track to get over to Paris next August for a long overdue catch-up. In the meantime, I may have to dedicate a French recipe post to you both.